The economic turbulence of the last few weeks of a bad GDP report for Q4, the negative trends in manufacturing, commodities prices collapsing because of declining demand, have led to chat of recession. This is understandable, but why there is belief that declines in manufacturing will not play out into a general economic decline because of a buoyant services sector is beyond me. 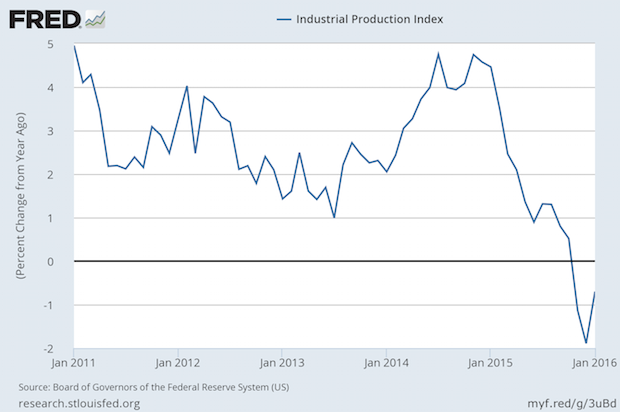 On Wednesday, February 17, the Federal Reserve's Industrial Production Index stayed in contraction mode. Its year-to-year growth rate has been declining for more than a year, and has been negative for a quarter. Everything is connected. Commodities require transportation (a service industry) and storage (a service industry), many of them regulated (legal) and workers in the processes are paid (payroll processing, finance and banking, which are service industries). That's just the most direct ones. Retailers exchange the money fruits of workers labor into goods. In those retail stores, workers buy manufactured goods. Retailers are a service, the channel of distribution for consumer manufacturers. Construction is a service industry that uses manufactured goods for buildings. The entire real estate business is a service industry, even if the building houses manufacturing. It's all connected, and claiming that the economy can withstand a decrease in manufacturing activity is a mistake. The NFIB small business index is back down to the range of two past recession bottoms, as noted in the chart. The professions were always service industries (legal, medical, and many others). But many service industries had their genesis in manufacturing and agriculture. The disaggregation of manufacturing to make core manufacturing distinct from business administration has been underway for decades. Companies had to have their own distribution network. Now they tap into independent networks like UPS and FedEx. They used to do their own payrolls. Now they use ADP and PayChex. They used to run their own worker pensions. Now they use investment banks and others. Just like the “70% of the economy is consumer activity” is a similar mistake. Those consumers pay for the other 30% in their taxes and their savings go to investment via the banking system. Don't mistake bookkeeping for economics. That's what these old saws like “Services will keep the economy strong” and “70% of the economy is consumers” do. Even though the formula for GDP is C+I+G+(X-M), the relationships are not independent as the formula implies.